For many people, nutrients can be a pretty confusing topic. Not only are there tons of companies to wade through, but some companies have multiple nutrient lines, extra supplements, additives, etc. And once you’re through with that, you still have to figure out how much and how often to feed your plants. 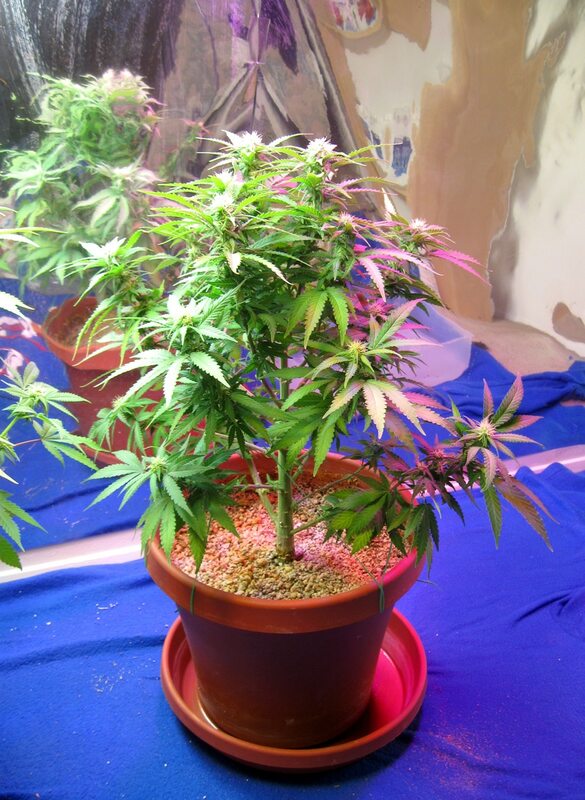 Luckily, many of the major nutrient lines out today will grow great cannabis. However, some can empty your wallet and leave you with much more work than is needed! 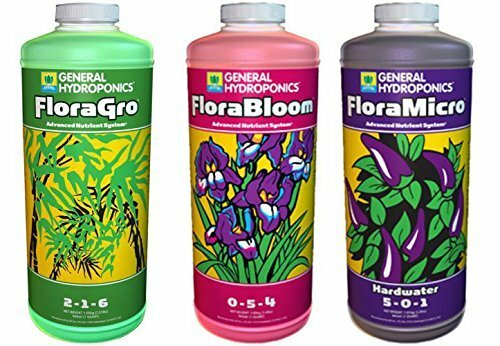 Today, I’m going to show you the nutrients we use – General Hydroponics Flora Trio – and how we use them. This is one of the simplest and easiest ways to do plant nutrients while keeping the cost low. If you’ve been stuck at figuring out how to feed your plants, this is the answer! Note: Don't let the name fool you, the Flora Trio is great for soil, coco coir, hydro, or almost any growing medium! General Hydroponics is the name of a company that makes nutrients, potting mixes and pH adjustment kits among many other things. They also produce a nutrient line called the Flora Trio. The Flora Trio is three bottles (Grow, Micro and Bloom) which are combined in differing ratios depending on your plant's stage of maturity. 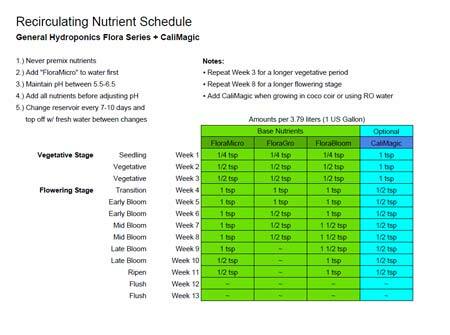 General Hydroponics – like most if not all nutrient companies – try to sell their base nutrients with a bunch of other supplements, but using just the three bottles mentioned will do everything you need in addition to saving money. We’re going to show you how to do it! GH Flora Trio tends to go for about $10-$14 per 32oz bottle, which comes out to $30-$42 for all three. That doesn’t seem cheap until you factor in two things: you only use a small amount at a time, and the expiration date on the bottles is pretty far off. My setup is on the larger end of what’s used for a personal grow, and still the $30-$42 worth of nutrients can last me years. Just as importantly, the nutrients will actually last for years even when opened as long as they’re properly stored. Many growers believe that the secret to getting medical grade bud with the ‘magazine look’ is having the right nutrients. 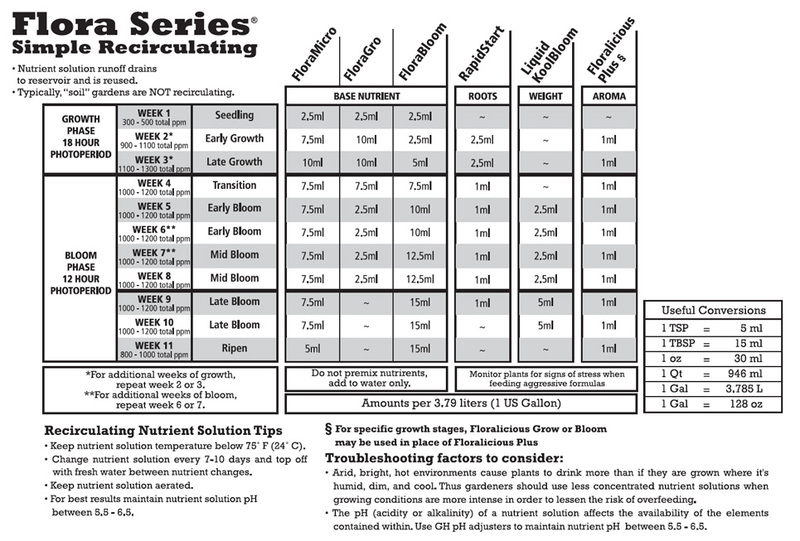 Believe it or not, all nutrient lines perform the same job: providing the basic elements your plant needs. The ways different nutrient lines provide these minerals can differ and the formulas they use can vary vastly, but these changes aren't what makes that envy-inspiring bud…it’s care and a lot of light! With that in mind, the Flora Trio works exactly like it should in that it just gives your plants the minerals they need. If you ignore the extra add-ons frequently sold with the Flora Trio, it becomes a simple, long lasting solution to a seemingly complicated problem. The simplicity of the formula they use (dissolved salts) makes it last 5+ years after being opened when stored correctly, and only using three bottles makes it simpler to use. The Flora trio is one of the most common nutrient lines made for plants like cannabis and is easily found online and at hydro stores. Good News! You may have noticed that no plant food in the US is easier to get your hands on than Miracle-Gro; that stuff is everywhere! But the standard Miracle-Gro formula is not good for growing cannabis. 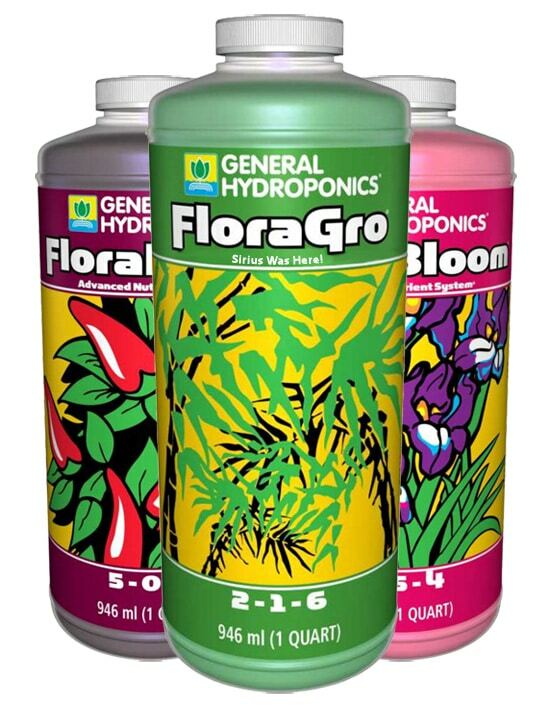 However, recently the Scotts Miracle-Gro company bought General Hydroponics Inc. and they plan to start putting the Flora trio (completely unchanged) in mainstream stores wherever you would find Miracle-Gro. So the dream of truly easily available cannabis nutrients will likely soon become a reality! Alright, now let’s get to how to actually use the stuff! Never premix nutrients (mix nutrients in water). 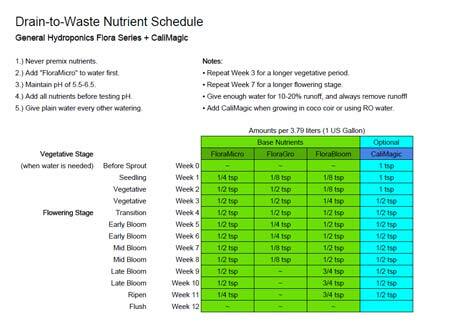 Add "FloraMicro" to water first . 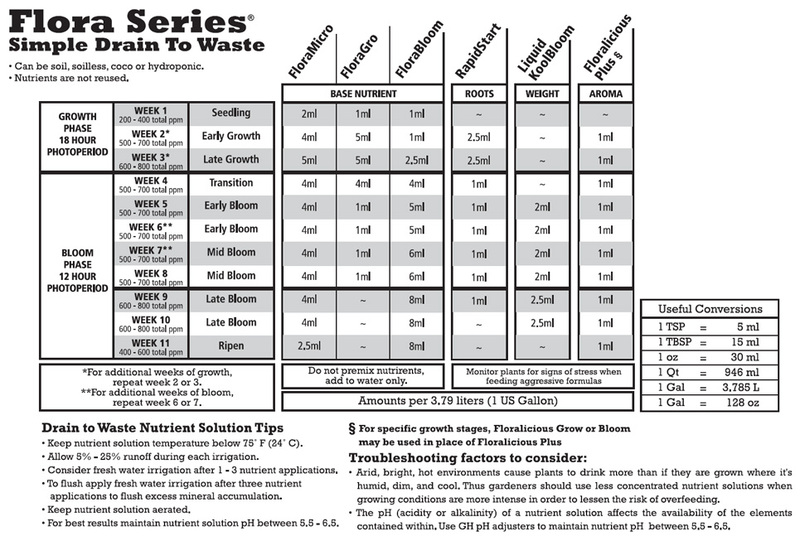 Add all nutrients before adjusting pH. Give enough water for 10-20% runoff, and always remove runoff! Change reservoir every 7-10 days and top off w/ fresh water between changes (recirculating). If you’ve seen the standard formula from General Hydroponics, you’ll notice that these amounts are half (at most) of the recommended dosage. We’ve found that the amount recommended tends to be a bit too high for cannabis. We recommend starting with the amounts listed above. If your plant shows signs of deficiencies, check the pH first as this is just as likely the issue. Learn how to check pH to prevent deficiencies! If you’ve confirmed your pH is in the correct range and you’re still seeing nutrient deficiencies, increase the amount of nutrients you’re giving your plants. 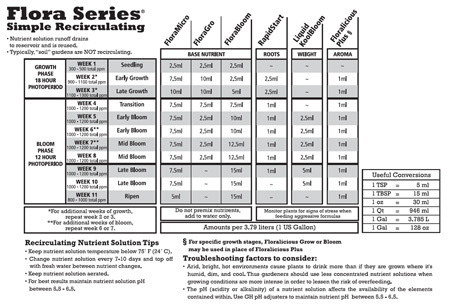 Make sure to treat the amount recommended by General Hydroponics (see below) as an absolute maximum; giving full strength tends to end in nutrient burn. Those using coco coir and/or reverse osmosis water will want to add a calcium/magnesium supplement to make up for the lack of it in your water. Growers using tap water will likely have more than enough calcium/magnesium in their water already, but it’s a good idea to add it if you know you live in an area with soft (more pure) water. As far as other supplements, you’ll see that the charts below from GH recommend a few of them. While we’re sure they have their merits, we don’t recommend using any of the ones listed unless you’ve tried this line already and want to experiment. From our experience, we’re sure you’ll get the results you’re looking for without having to add three extra bottle to your nutrient line-up. Now for the standard instructions! Personally we've found the extra supplements and higher levels of nutrients recommended by General Hydroponics to be unnecessary. We get great results using the more simple and cannabis-specific nutrient levels recommended by our custom schedule! Here are a few tips about this nutrient line that’ll save you some time and money! You can make nutrient-water in advance and store it for up to a week. 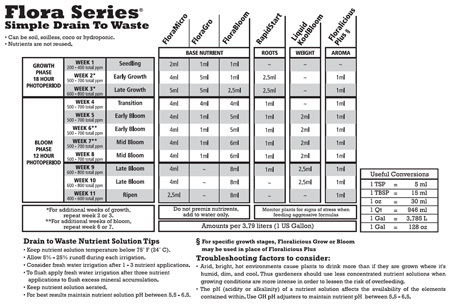 Some people store nutrient-water for longer, but a single week is considered safe by General Hydroponics! Store your nutrient bottles in a darkened area (no direct sunlight) with cool (but not freezing) temperatures. When stored properly, these nutrients can last for over 5 years even after they’ve been opened! Try using a pipette to get Flora Micro out of the bottle. This way you avoid having to pour it which can be a pain as it has a weird consistency that makes it easy to spill while pouring. Using small amounts of nutrients not only makes it so you save a bit of money, but it makes your nutrient-water a lighter color. This in turn makes it easier to use drop-type pH test kits which are super cheap! A drop-type pH test kit can also last years when stored and used properly! I know it sounds like a no-brainer, but make sure you put down a towel before your pour nutrients! Two of the liquids are pretty tame, but Micro is wine-colored with an odd consistency! 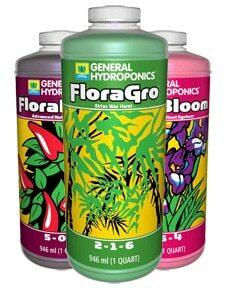 Get the General Hydroponics Flora Trio Today!